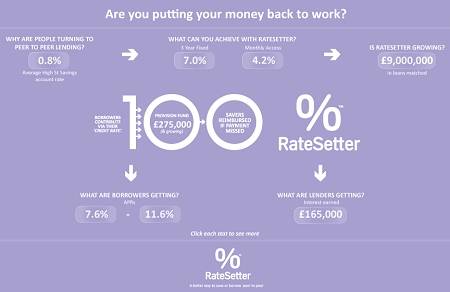 Ratesetter yesterday introduced a new sellout function that allows lenders to exit their contracts early. Lenders request the amount they wish to have returned to their Ratesetter Holding Account. Ratesetter works out whether this is possible and calculates the cost of doing so. The Lender confirms their wish to go ahead and then Ratesetter processes all the necessary assignments. The Borrower will remain entirely unaffected by this. What are the costs involved in exiting early? • An “Assignment Fee” to ensure that if the interest rate in the relevant Ratesetter market has gone up the exiting Lender can still exit. This will calculate and deduct from the exiting Lender the amount required to be added to the interest rate to ensure the incoming Lender gets what they expect. In circumstances where interest rates are the same or lower there will be no Assignment Fee. Can the lender choose which individual contracts I sell? No, the contracts will be automatically selected, starting with the most recent contracts. Where does the incoming Lender come from? From the same market as the exiting Lender. Are there any circumstance when the lender would be unable to exit early? • If there are insufficient funds in the relevant market. This will be determined by a “buffer” of available funds (of which the amount in each market will be periodically reviewed) designed to keep the smooth running of the Ratesetter markets. • If an individual contract is less than £10, the current minimum reinvesment size. Offering a secondary market (regardless in which form) is becoming a basic functionality that lenders expect as a core feature from a p2p lending service. The 3 major British services Zopa, Ratesetter, Fundingcircle as well as American Lending Club and Prosper now offer the ability to sell loans. In other countries regulation makes the setup of a secondary market difficult. In England p2p lending service RateSetter celebrated it’s first year in business anniversary a few days ago. The loan volume matched is close to 9 million GBP, spread out over 2.400 loans.RateSetter has currently about 65.000 members. RateSetter has a rather unique business model in the p2p lending landscape which builds on anonymously matching demand and supply for two loan “products”: 36-month loans and rolling loans (the total loan volume is spread nearly 50:50 on these products). RateSetter says that due to the provisions fund mechanism “every single RateSetter lender has received every single penny of capital and interest that they expected.“. The fund is an instrument set up by RateSetter to “reduce the risk for lenders“. Borrowers pay an amount upfront into the Provision Fund based on their creditworthiness. Yesterday RateSetter announced that on Sep. 3oth the team managing the Fund decided not to distribute any money from the Fund back to the lenders, which is possible if the team considers the Fund to be excessivly capitalised. Borrower representative APRs ranged from 7.6% to 11.6%. 79% of borrowers are homeowners. The two purposes car loans and home improvement loans were given for more than 50% of the loans. In the last six month, interest rates for 36 months loans on RateSetter have been falling, whereas the rates for the rolling loans remained mostly at the same level. RateSetter is a founding member of the Peer-to-Peer Finance Association (see: ‘Peer-to-Peer Finance Association Founded by British P2P Lending Services‘).